KnuckleBonz, creator of the Rock Iconz music collectible series, has announced the production of a Yngwie Malmsteen statue, available HERE. Each statue sells for $149 and ships worldwide. 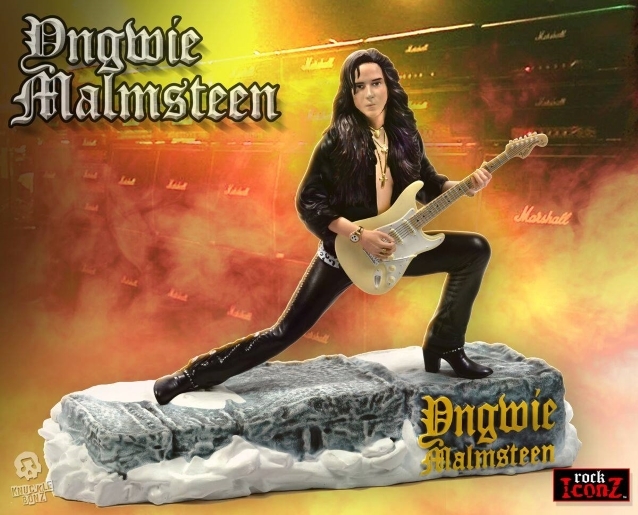 The Yngwie Malmsteen Rock Iconz statue is a limited-edition collectible. This collectible statue features Yngwie on top of his stack with his signature Fender guitar. This is a limited-edition collectible; only 3,000 are made by hand and sold worldwide. Each statue is hand-painted and numbered and come with a certificate of authenticity printed on the base of each collectible statue. KnuckleBonz has been creating high-end statues since 2003 and continues to be dedicated to honoring music's greatest performers through master artistry in the limited-edition statue series called Rock Iconz. The company's goal is to capture a "live performance" moment in each limited edition.